Do you know that cash savings is a good risk management tool that can improve the return of your investment portfolio? Having available cash to cover your living expenses during unforeseeable future life circumstances will help you avoid taking additional distributions from your investment portfolio during unfavorable market conditions. The probability of additional, unexpected, distributions increased during economic recession when unemployment increases and stock prices decline. Having cash savings will provide you with time to find a new job, to adjust your spending, or to wait for stock and bond market to recover. 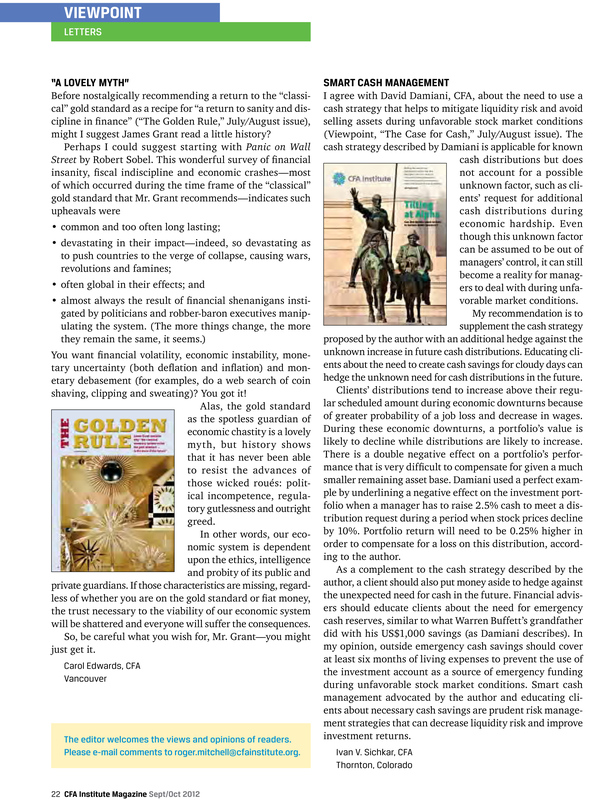 My letter “Smart Cash Management” was published in CFA Institute Magazine September/October 2012. Below you can see a copy of this letter. It was written as a response to an article by David Damiani, CFA “The Case for Cash.” In my letter, “Smart Cash Management”, I argue in favor of cash savings as a hedging tool against unexpected events and reliance on investment portfolio for additional income. In my opinion, investment advisors should promote cash savings among their clients as a tool to hedge against unplanned distributions that can hurt investment returns. A simplified numerical example below, following the article, provides one illustration as how an individual investor can benefit from cash savings. Copyright 2012, CFA Institute. Reproduced and republished from CFA Magazine, September/October 2012 with permission from CFA Institute. All rights reserved. Cash savings, as almost any other hedging tool, does not come at zero cost. Having cash savings bears its own cost to investor. Current, near zero interest rates do not provide much return on cash deposits. The investor will forgo an opportunity to earn greater return on investment in return for a safety net. However, the loss of a potential investment return can be recovered when the safety net is used. Let’s look at a simplified numerical example as to how cash savings can improve investment return in the long run. 1. Individual investor, John, has investment portfolio worth $100,000 and cash savings account worth $20,000. John earns $40,000 per year after tax from his job; His investment portfolio is 100% invested in the SPDR S&P 500 (SPY) exchange traded fund. His salary is enough to cover all his living expenses of $40,000. Let’s assume that his salary and living expenses remain constant going forward. John is a self-employed architect. 2. At the end of the year 2007, his portfolio value has increased to $105,146 (see table 1 below) and his forgone return on cash was $1,029. He is happily employed and continues to cover all his living expenses of $40,000 with his entire salary. 3. At the end of the year 2008, his portfolio lost 36.79% and is now worth $66,461. Cash savings remain unchanged at $20,000 and John continues to work and meets all his living expenses with his income from employment. 4. On January 1st, 2009, John loses two of his main clients and experiences decline in his salary by 100%. John is not able to adjust his living expenses in the short-term. He has two options: 1) to use cash savings or 2) to sell part of his investment portfolio to supplement his reduced salary. His salary will return to $40,000 level in 6 months. 5. Since John used cash savings as a risk management strategy, he is able to meet all his living expenses with his remaining salary of $20,000 and cash savings of $20,000, without relying on his investment portfolio for income. At the end of June 2009, John’s investment portfolio will be worth $68,585 (3.2% gain, see table 1), which will then increase further by 22.43% before the year-end of 2009 and will be worth $83,968 (see table 1). Table 1. Historical Changes of Net Worth for John and Bill. Investment performance was based on SPDR S&P 500 (SPY) historical close prices adjusted for dividends and splits. All data for SPY was provided by Yahoo! Finance website: http://finance.yahoo.com. 1. Bill decided not to have cash reserves and instead invested all his money in SPDR S&P 500 (SPY) exchange traded fund. At the end of 2006, his beginning portfolio value is $120,000. His after tax salary of $40,000 will cover all his living expenses of $40,000. Both, his living expenses and his salary will remain constant going forward. 2. At the end of the year 2007, his portfolio value increased to $126,175 (see table 1). He is happily employed and continues to cover all his living expenses of $40,000 with his salary. 3. At the end of the year 2008, his portfolio lost 36.79% and is now worth $79,753. Cash savings remain unchanged at zero. 4. On January 1st, 2009, Bill shared the same misfortune with John and saw his salary decline by 100%. Bill is not able to adjust his living expenses in the short-term. He has only one option: sell part of his investment portfolio to supplement his reduced salary. His salary will return to $40,000 level in 6 months. 5. Since Bill does not have cash savings, he is forced to sell some of his investments at a steep discount due to unfavorable market conditions. He sells $20,000 worth of securities on January 1st, 2009 which decreases his portfolio value from $79,753 to $59,753. At the end of June 2009, John’s investment portfolio will be worth $61,663 (3.2% gain on SPY, see table 1), which will then increase by another 22.43% before the year-end of 2009 and will be worth $75,493. Based on this simplified example, using cash reserves as a risk management strategy, John’s net worth came out to be $83,968 or 11% greater than Bill’s net worth of $75,493 who did not employ cash reserves in his risk management strategy. Please note that this example was simplified to demonstrate a case where cash reserves can benefit an individual investor and improve investment performance. This example is not all-inclusive and does not represent all possible outcomes that may happen in real life or in the future. It is only based on historical performance of SPY during 2006-2009 years and does not represent any future outcomes that are likely to be different. There can be another, less favorable, outcome for an investor with cash savings when stock prices continue to increase and forgoing income opportunity on cash reserves continues to rise. In this case, an investor with 100% exposure to the stock market will be better off than someone with cash reserves. This is an example where smart cash management as a risk management strategy has its own cost. Besides risk management and hedging against unexpected distributions, cash can also be used as a good short-term inflationary hedge, assuming low level of inflation. Most banks pay a short-term interest rate on money deposited with them. As inflation increases, this short-term rate will also increase. As long as inflation remains modest, short-term savings rate will adjust and partially compensate for an increase in inflation. Income earned on cash savings will not be enough to cover all increases in consumer prices. That is why, limiting cash savings to cover 6 months of living expenses and having other higher yielding investments is a prudent investment and risk management strategy. This risk management strategy provides a peace of mind and a safety net to an individual investor. It also reduces exogenous risk of unexpected cash distributions which portfolio managers cannot predict or adequately hedge against. More predictable cash distributions will improve the investment performance and will eliminate the need to sell investments at a steep discount. Cash savings will provide enough time for investment professionals to liquidate holdings at favorable prices or for a client to adjust his/her expenses or find a new job. As the result, an individual with cash savings can see his/her risk exposure to decline and net worth to increase in the long-run under certain circumstances. Disclaimer: This article is intended for informational purposes only, to exchange ideas and to collaborate with fellow economists and investment professionals. It is not intended to give any advice, but to express an opinion only. Please consult with your financial advisor before making an investment decision.